LUCKYRICE, the Asian-spirited culinary festival that launched in 2010, will announce its grandest line-up yet during a magical night filled with food as art, interpretive cocktails and seductive entertainment marking the Year of the Rooster at the Bowery Hotel in New York next Friday, Jan. 27. Tickets are available atwww.luckyrice.com. The Lunar New Year’s Eve Bash begins at 8pm with the Edible Wonderland, an immersive experience for just 88 guests. The “wonderland” includes 8 whimsically designed good-luck food stations where noodle pullers, dumpling makers and other artisans will offer auspicious treats, theatrical performances (including traditional Chinese erhu players and sultry jazz chanteuses) and surprise gifts inspired by the Year of the Rooster. 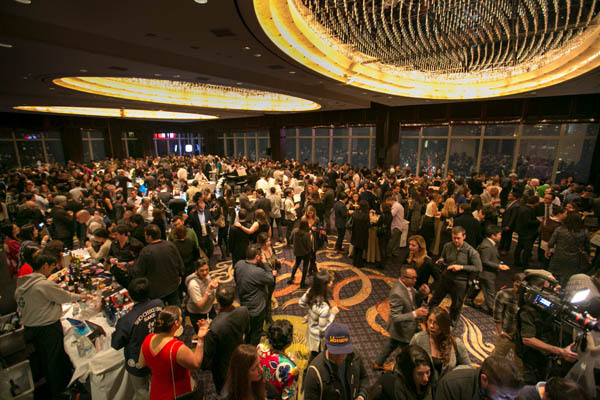 Following the VIP reception, the doors will open to welcome 888 guests for the evening’s second act, LUCKYRICE’s popular annual Epicurean Cocktail Feast, from 9:30 – midnight. Eight top mixologists from our favorite New York drinking spots — Sanatorium, Lumos, Maharlika, The Vnyl, PS450, Macao Trading Co, Fifty Restaurant and Extra Fancy – will serve up interpretive cocktails incorporating Asian flavors and ingredients. This is LUCKYRICE’s most ambitious and diverse year of programming, with new events in eight cities including San Francisco, Las Vegas, Chicago, Los Angeles, Brooklyn, Houston and Miami. The interplay between food and art provides the inspiration for the 8th annual LUCKYRICE festival, as the creative spectrum of Asian cuisine and culture captivates our global imagination today more than ever. Playing off of last year’s cross-cultural culinary collisions, this year’s festivities highlight the space where food and art converge.